Today we read about Thomas Vander Veen’s military activities in France from October 9-14, 1918 along with Natalie Fulk’s comments. ● Comments: Vander Veen and his company were sent back to the front instead of going to the rear as he wanted. 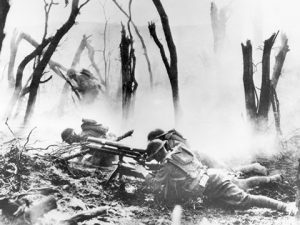 The woods around the front were a difficult terrain to navigate and were one of the reasons that the German troops were able to keep up their defense as long as they did. ● Comments: Vander Veen’s special duties as a messenger meant he separated from his company that day to deliver a message to the rear. The woods would have made it very difficult to navigate between the front and the rear. This was the start of the days for which he received a Distinguished Service Cross for his efforts. ● Comments: Vander Veen and his company dealt with very personal loss on this day. This entry especially shows the danger the soldiers faced daily and the costs that came with that. Vander Veen’s job was so treacherous that replacement messengers were sent with him to ensure that the message was received if he was shot. ● Comments: After being on the front since October 9, Vander Veen’s company was splintering as the fighting dragged on. ● Comments: Vander Veen and his company were relieved from the front and moved farther back. However, they were still close enough to the front to be possibly moved to the front again. Vander Veen in this entry criticized the men in his company who had left when the company was on the frontline and then joined it again in time for roll call once it was back in reserve. This was a fairly common problem in the American Expeditionary Force during the war, and these men would probably have been classified as stragglers. Straggling was a type of desertion that the AEF defined as someone wandering away from the rest of the troops for reasons of “cowardice or … lack of physical and moral stamina to endure great hardships or death itself.” However, it is understandable that these men would be scared for their lives with the dangers they faced, especially if they had been drafted and did not enlist themselves. For earlier journal entries visit the Joint Archives of Holland.